penny: what a week! i got back home from shooting a wedding in iceland and within about 30 hours we were hopping in the car to go to charlotte to attend a wedding. we arrived at your aunt and uncles house, your dad and i got ready, and we left for the wedding leaving you with your older cousins who were babysitting for the evening. we were at the ceremony for approximately 5 mins when we got a call from your cousin that you were running in the house, tripped, hit a corner baseboard, and got a pretty good cut on your head. it took a few back and forth calls to figure out that it might just be deep enough for you to need some stitches. daddy and i headed right back to you and took you to urgent care. we were hands down the fanciest folks in that waiting room! after a few worrisome tears from you, and a few choked back by me, you left there with 4 staples, 3 stitches, 2 stickers, and one lollipop. even with all that craziness you still wanted to swim with your cousins the next day. we weren't supposed to let your cut get wet for the first 24 hours, but the thought of you sitting on the side of the pool watching everyone have fun without you was just too much for my mama heart to take. enter aunt missy and her save the day skills! 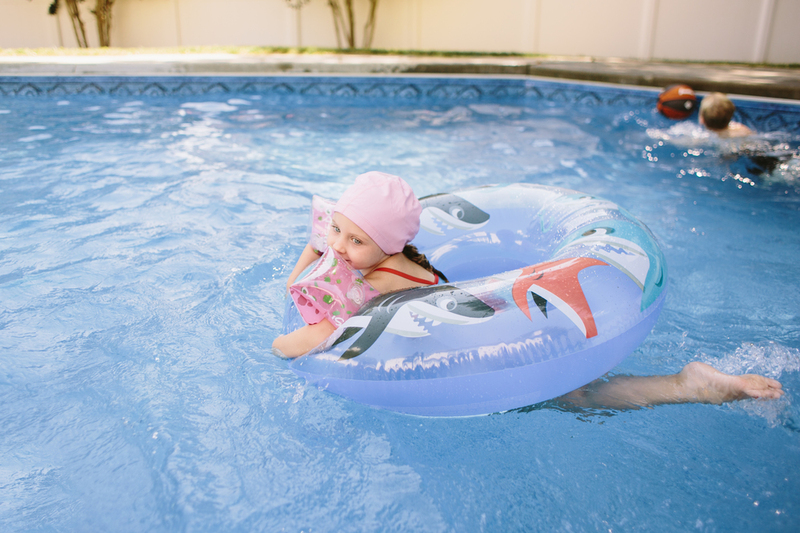 she picked you up this little pink swim cap and you were at least able to float around and play with everyone. and the fact that it's cute as all get out didn't hurt one bit either!